As on Wednesday, so today. A piece made to measure by Neapolitan brand Stile Latino, with similar attractions. Unlike the coat, however, it has some genuine structure. There is a light shoulder pad and a small chest canvas, lending it more solidity and suggesting it will wear better over time. I’m also a genuine fan of the material. Many brands make sweaters that look a bit like jackets, and jackets that feel a bit like sweaters. 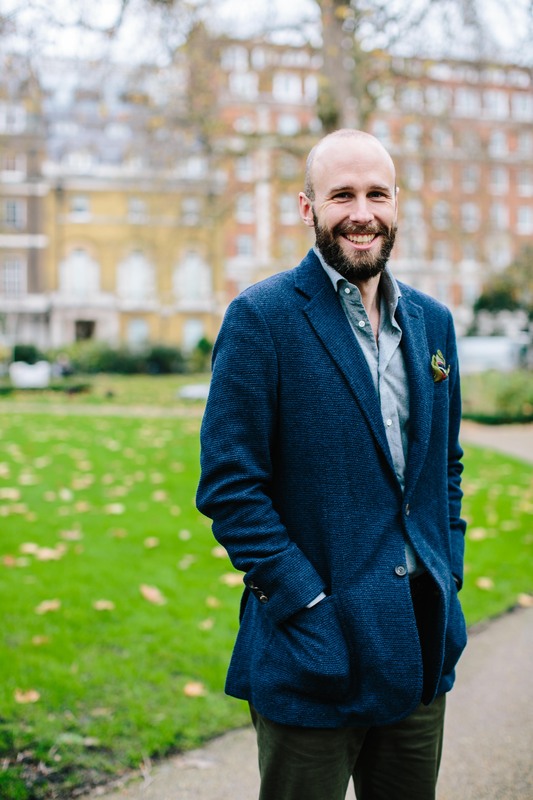 I’ve tried many of them – from Boglioli, Beams, Kiton, Caruso, Barena, Isaia… It’s a worthwhile thing to pursue, and fills a genuine need among men looking to dress down their suit or dress up their T-shirt. This achieves that crossover better than any others I’ve seen or worn. 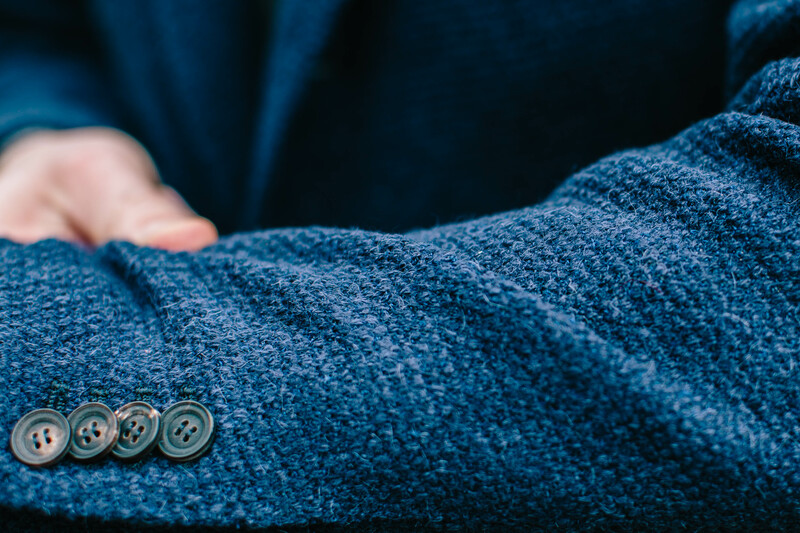 It combines the comfort of a sweater with the formality of a jacket. I can wear it all day long, and it looks both smart(ish) and relaxed all day long. It makes me want to push my hands down into the pockets (as I’m doing, top) and feel it spring back again. You can follow the discussion on The in-between (pub, weekend) jacket from Stile Latino by entering your email address in the box below. You will then receive an email every time a new comment is added. These will also contain a link to a page where you can stop the alerts, and remove all of your related data from the site. Happy new year Simon. I look forward to follow your blog for at least another year. 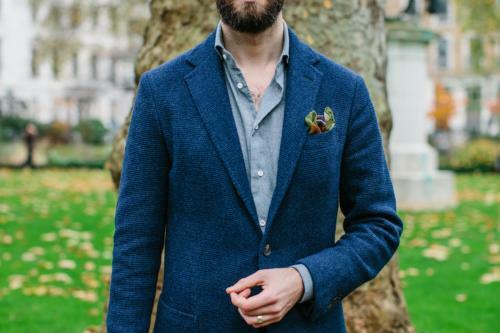 Surprisingly similar to a Thom Sweeney RTW jacket I purchased a few months back. A brown weave just like this in an identical style. I have found it almost as versatile as a grey tweed: herringbone, and a welcome change. The TS cut does make it a little more formal though. Like you I do keep putting my hands in the patch pockets but do worry about stretching them out and sagging the jacket. I have an ST Jacket with the same problem with the vents not closing. Is it possible to remedy this? Extremely well hung sleeves for a jacket with do little construction. I see your point about the side vents; however, these add to the casualness of the garment. Nice material. Happy New Year! Interesting post Simon. Do you iron your chinos flat or with a crease? Whilst I like the cloth and totally approve of the idea of how and where something could be worn, it doesn’t take away from the fact that this is a shocker in terms of fit and it simply should not have left the premises. Was this RTW or MTM? I struggle a bit with a coat at either price which fits so poorly. I would just walk away and spend my money elsewhere. Why buy something which doesn’t fit? Although there’s only one photograph – you from the side – I think the jacket fits you very well. And the shoulders look perfect, too. PS: The central button placement looks right, too. O dear, I missed those other two photographs! But the jacket fits excellently! Really not that a good value for money. If I remember well you have several bespoke jackets from neapolitan makers which are nicer so why going back to overpriced MTM? 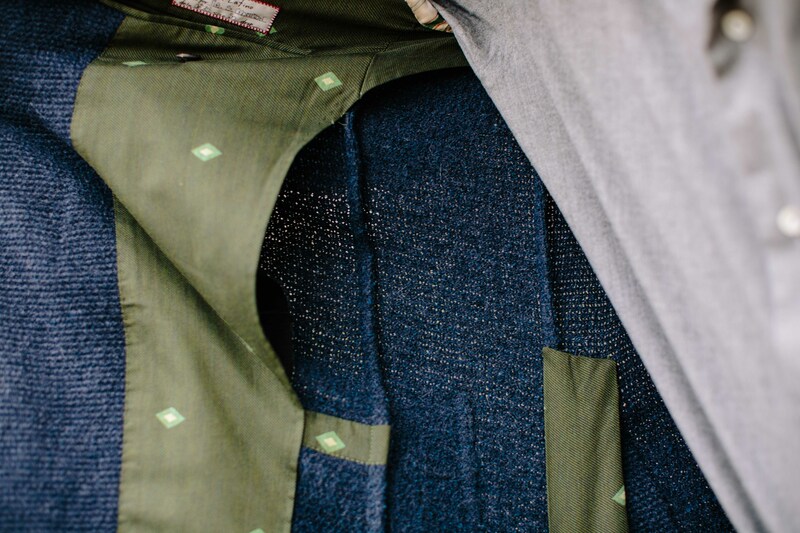 The problem with high-end high price tag MTM is that you end up paying a heavy premium for lengthening a jacket but still not being able to address more forward fitting issues (remember your Kiton Lasa suit). So why still ordering MTM garments? Very true. A jump off to ask you – if you accept moleskin or needlecord as jacket cloth – which do you prefer, and why? Happy new year to you, PS team and your readers over the world! Now to my first comment of the new year. The jacket has a lovely blue hue, enough versatile for various trousers’ colors. Indeed, it could be easily up or down graded too, thus another feature of its versality. Most importantly, I think you have managed to strike the right balance between stretchability of the fabric and fit of the jacket. By no means, this is obvious. Recently, I have seen pics of the great Armany himself wearing a blazer whose fabric was obviously stretchy. Unfortunately, the jacket was cut too tied. He could stretch it, and of course had done it. But each time, the end result was anyhow awkward. Therefore, it’s worth bearing in mind that a strechy fabric shouldn’t be an excuse to forget the importance of fit! I also, prefer centre vented sport coats for wear with denim and t-shirts. Double vents always seem wrong to me when paired with jeans, too affected, whereas the 3 button and centre vents makes sense. And achieves this crossover style very well. Interesting perspective. Certainly with you on the three buttons, though have never liked centre vents, and I don’t think the side vents look too formal. Losing the darts also often makes the jacket a bit shapeless, which I dislike in all tailoring. I haven’t tried Keydge, but from the name I’d guess that applies to this jacket? These suggested jackets are too casual to be helpful for the kind of purpose we may have in mind with the jacket under review here. Happy New Year to you Simon and best wishes to PS for 2016. Looking forward to another year of great articles. Nice jacket, though for weekend wear I’d question the value for money aspect. As with the other item it is the choice of cloth that gives it real interest. It would probably look more fitting sans hands in pockets and perhaps with a cashmere scarf at the next. Irrespective of this it is good to see you smiling and relaxed (if not a little cold!). “Too affected” is not really what I meant to say. I supposed I mean the side vents make it look… forced? And as a result affected…? Apologies for thinking out loud on your website! 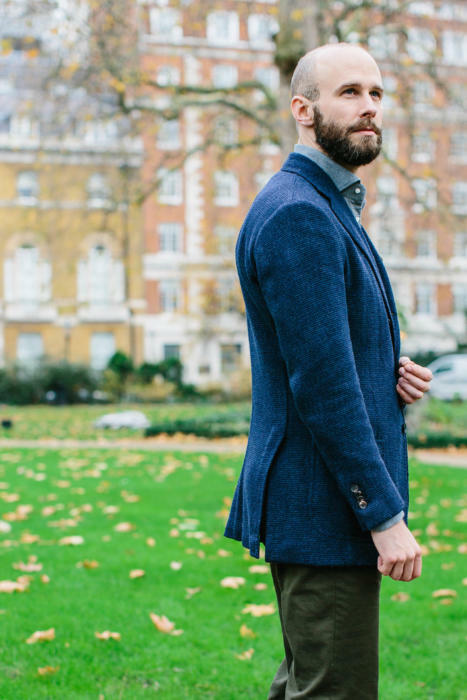 As the centre vent, natural shoulder and 3/2 roll was part of they Ivy League Look back in the day, this places it in the causal tailoring Americans used to do so well; the odd jacket/smart casual look. The Keydge has some waist suppression but no front darts. The seasons Shetlands are a little boxier, perhaps. But, as the Shetlands are more akin to a cardy than sportcoat they’ll soften up and wear well. For fans of unstructured odd jackets it’s a decent RTW option. Always lots of seasonal variety. Can you tell I have a few? I think the reason the centre vent works for me is that its the logical progression from the Shawl Collar cardigan. Or rather closer to the Shawl Collar and this makes it more suitable, in my mind, to pairing with denims and/or t-shirts. I like the shawl collar but not as an outdoor layer- so a nice slouchy unstructured wool sport coat, with a cosy 3 buttons and a popped collar does the job…Weekend/ Pub-tastic! Thanks, though I’m not sure I see the connection – none of my shawl-collar cardigans have a centre vent? Apologies for this being in the wrong section, but I have seen a selection of Drakes shirts for sale at half price, and I was wondering whether you had any insight into their quality? They say that they are non fused etc, but are they worth the premium over “regular” rtw shirtings? The side vents could be shorter…looks to fit well though…buttoning point is low when not wearing a tie and don’t know about that unbuttoned shirt! Simon – I really like the jacket (some of the negative fit comments seem overblown) but it is fairly expensive. I recall that you are not a fan of tebas but the MTM Justo Gimeno tebas that I have ordered through the Armoury over the last year or so have fulfilled the in-between jacket role very well (linen for summer; wool for winter) and for less than half the price. All the best for 2016. Thanks, yes I can see how they’d fit well in that role. How would you compare the quality between high level neapolitan made to measure (like Stile Latino, Kiton and Attolini) with “cheap” bespoke (like Graham Browne)? But on the broad comparison, it’s about finishing detail. So GB will do much less by hand, less hand finishing. Neither will hand-pad their chests, like most bespoke. Thanks Simon. I have too many suits and needs to sell some or give away to charity. I have two GB suits and a half dozen of Attolinis. The “problem” with the GB suits is that i rarely use them because of the style that is very formal. (But i prefer the Harrison Frontier cloth in the GBs to the thin italian wool). Am from Singapore and I am a big fan of your blog. I have a question that would like to seek your opinion on. 2) A wool dark brown/burgundy ring jacket “balloon” jacket that looks like a cross between the a jersey knit and a sports coat (akin to the sports coat you reviewed above). The texture looks like its more suited for winter wear, something I would wear during trips overseas and may not be appropriate to wear in Singapore. I would like something that can bridge the gap between these two. One that I can wear in Singapore (perhaps in air conditioned places or during cooler months) and also for overseas trips too that would complement the colours of sports coat I already own and perhaps, not appear so “wooly” in texture too. Would like to ask your opinion on fabric, colour and design for a third sports coat.